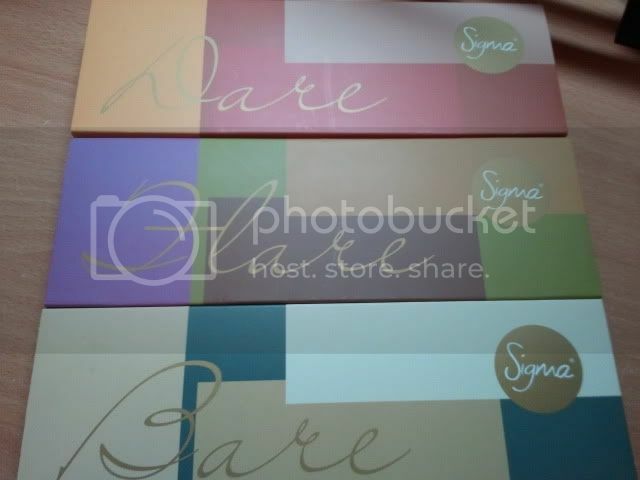 I purchased all three eyeshadow palettes from Sigma. 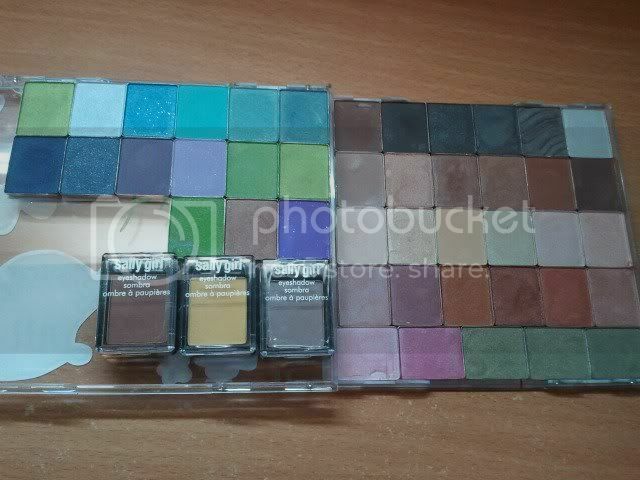 I have not used them yet, other than to swatch and play around with. So far, I am in love with them! 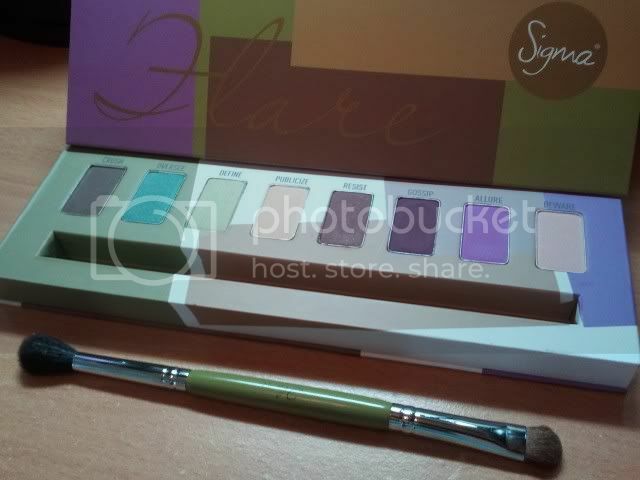 I love the colors, the brushes, and even the packaging (which has been called bulky.) 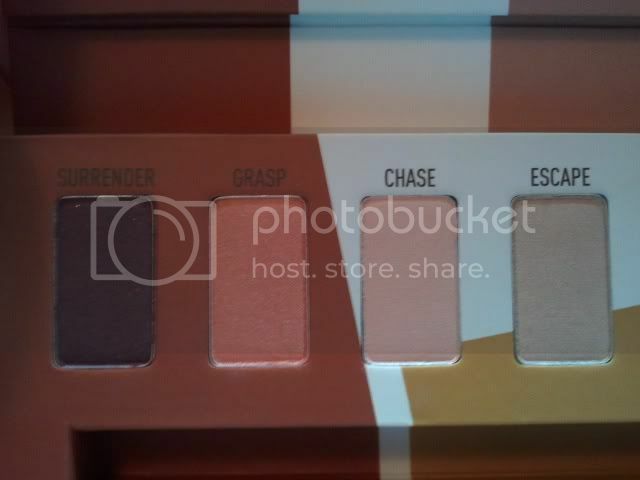 You get a dual-ended brush in each palette. 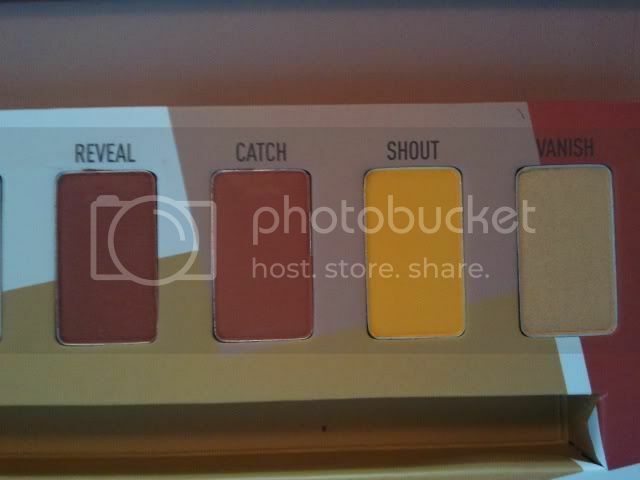 What really surprised me was that each end is different ... in every palette. In other words, it is like you are getting 6 brushes, that's right, SIX. That is so awesomely amazing in itself. 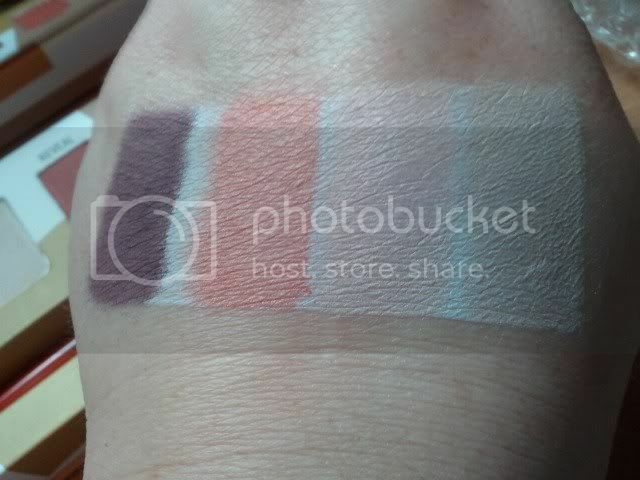 I did the swatches over a NYX whte eyeshadow base that I had applied to my skin beforehand. 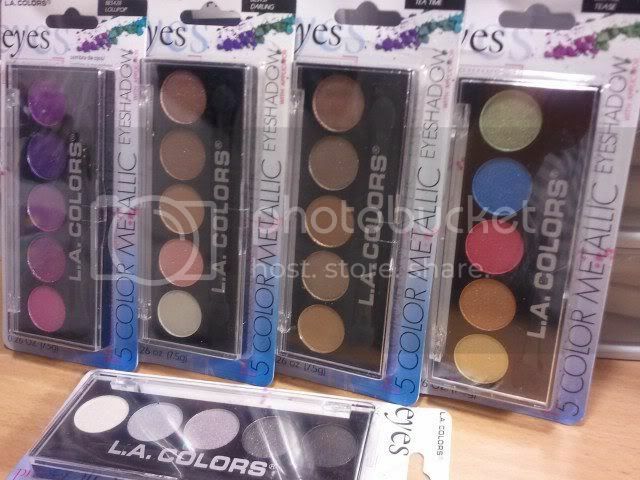 I am anxious to use these palettes and give an in depth review on them. 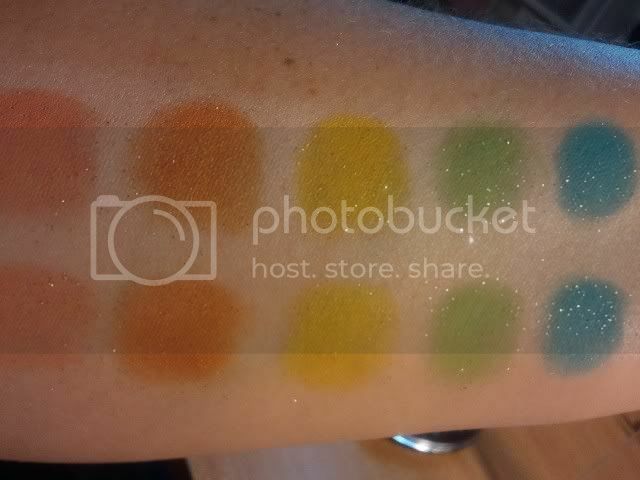 From left to right: Surrender (matte maroon with pink glitter), Grasp (coral shimmer), Chase (light matte pink), Escape (shimmery almost iridescent beige-y pink), Reveal (copper shimmer), Catch (matte brick red), Shout (matte orange yellow), & Vanish (orange gold shimmer). 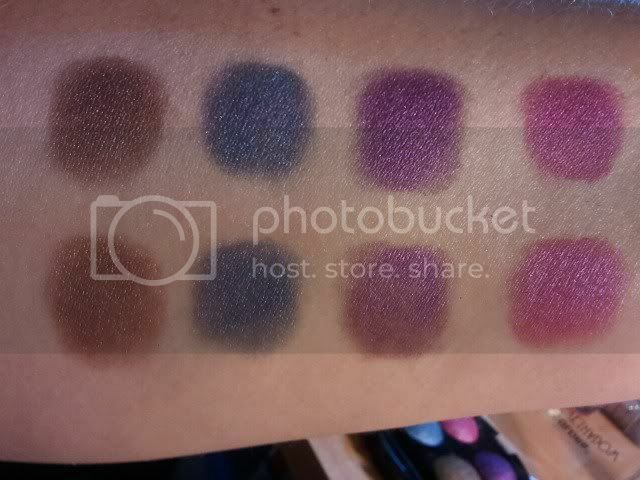 From left to right: Crush (matte brown), Oversee (teal shimmer), Define (gold lime shimmer), Publicize (light matte peach), Resist (matte burgundy with pink glitter), Gossip (matte eggplant), Allure (matte violet), & Beware (pale pink). 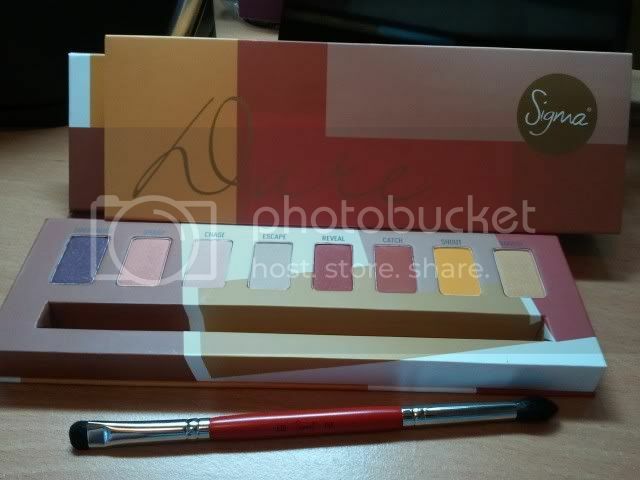 As soon as I have time to thoroughly use the Sigma palette, you can expect a review on my YouTube channel. I may do a tutorial as well, especially if requested. Thanks so much for reading guys! 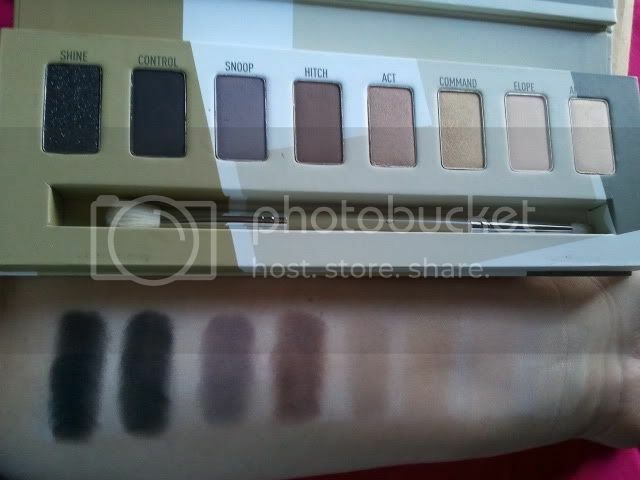 I hope my swatches helped some of you that may have interest in the palettes. 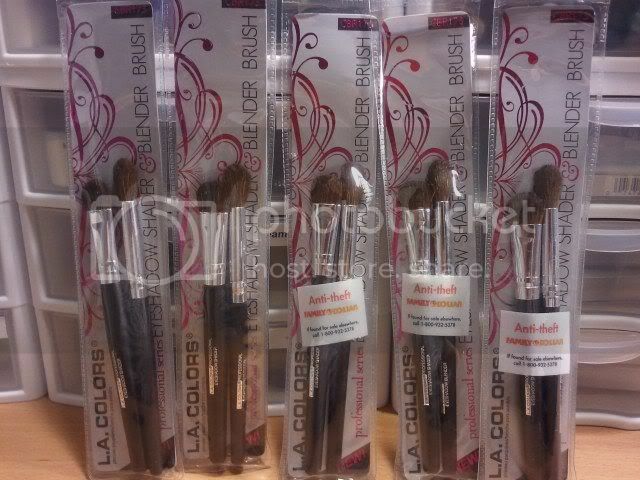 They seem to be a good buy considering the quality looks great, as well as having a dual-ended brush included. Which Brush Do You Prefer??? 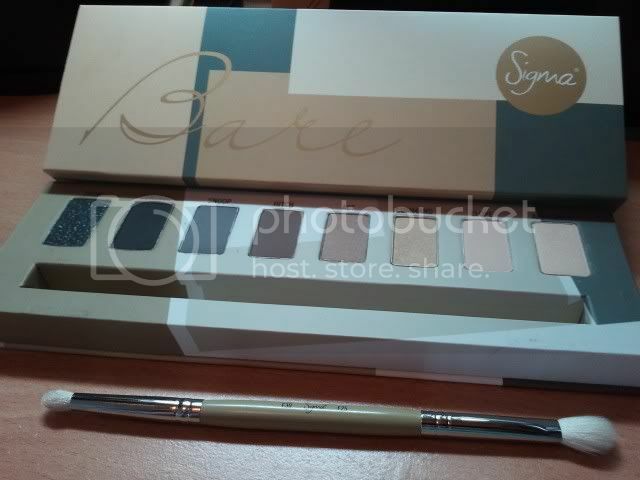 Sally Girl Cosmetics on Sale! 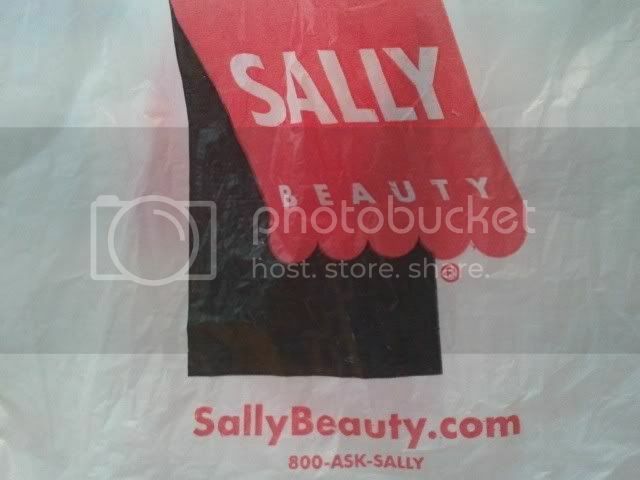 I went to Sally Beauty Supply on 7/19/11. They are currently running some good sales! 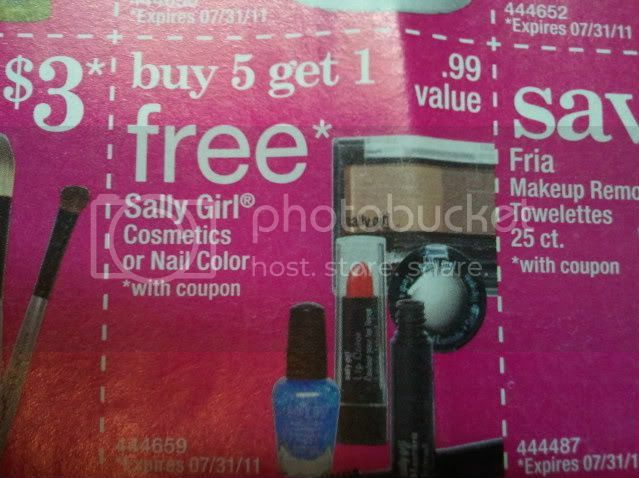 Their Sally Girl Cosmetics are buy 5 get 1 free. 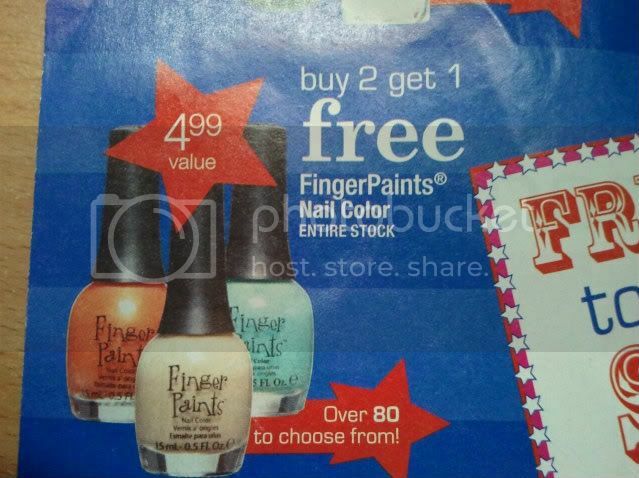 (Good through 7/31/11) I think these are decent products for only $1!! 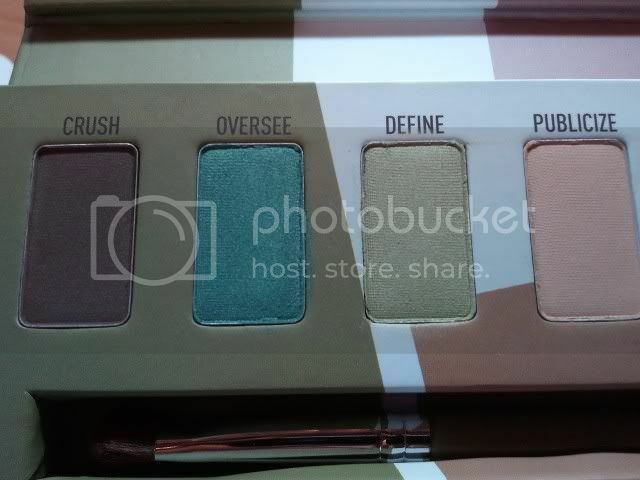 I really like the eyeshadows. I own most of them. 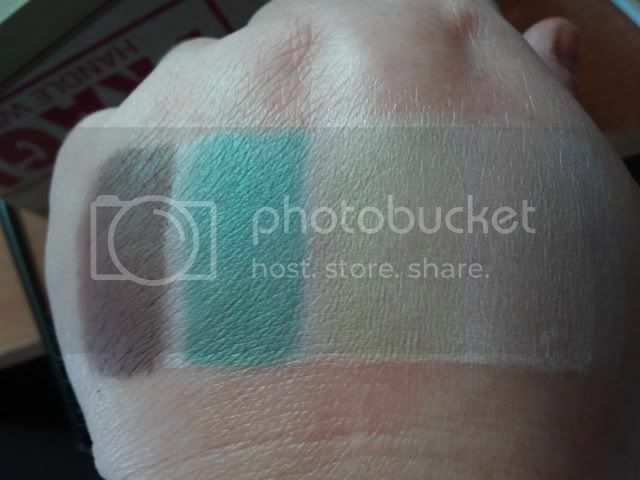 (I made a homemade CD palette out of them which I will picture below.) 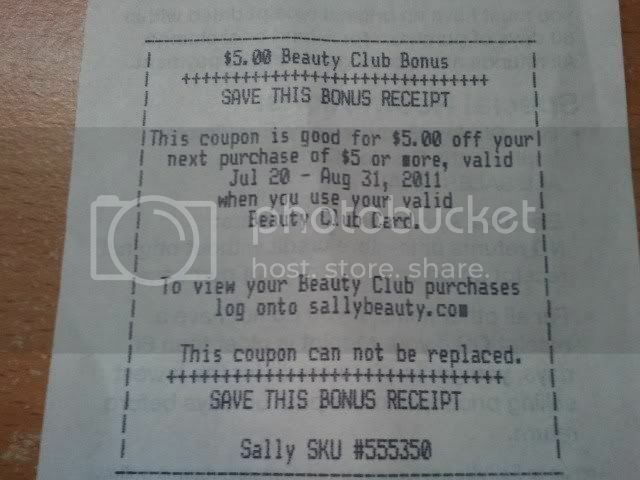 I also got a coupon with my recent purchase, for $5 off your purchase of $5 or more that is valid 7/20/11-8/31/11. So that was quite a good deal! If I make it back to the store before the sale ends on 7/31, and I buy 5 more Sally Girl products (using my coupon) it will be like I got 12 items for only $5. 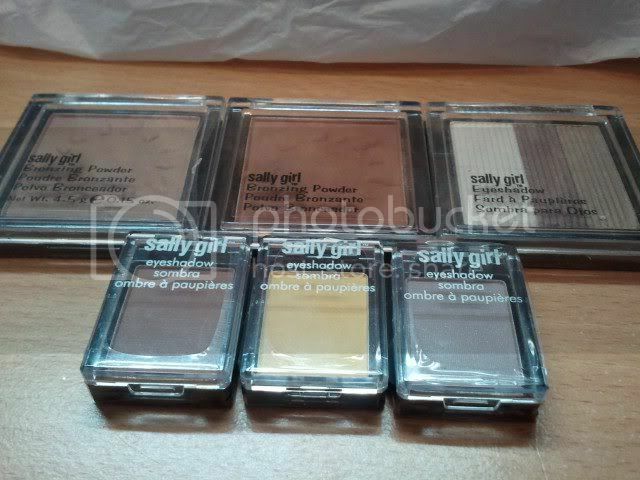 The Sally Girl eyeshadow packaging is really convenient because each one slides together and you can connect as many as you want, or you can choose to depot them like I did. Another offer I really wanted to take advantage of, was the buy any 3 full-size Ion products and get a free Hard Candy Carry-All that has a $29.99 value. They come in hot pink, teal, and purple! I had grabbed an advertisement on my way out and didn't really look at it until I got home, otherwise I would have grabbed one while I was there! There are still a few days to get in on this sale and quantities are limited on the bags so hurry! Below is a link to the ad so you can check it out!! I was sent six products to review. 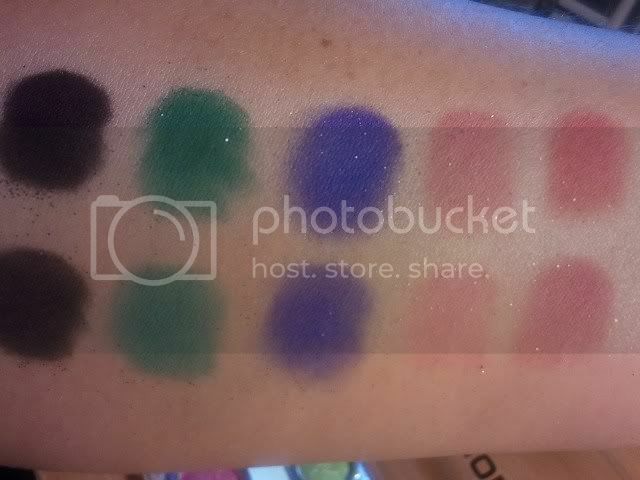 The Glittering Starlet Eyeshadow Palette in Bette, the Baked Eyeshadows in Neptune, the Glitter Liner in Iced, the Moisturizing Glossy Lips Sheer Lipgloss in Strawberry Jam, the Art Deco Nail Art Laquer, & the Color Craze Nail Polish in Lightning. 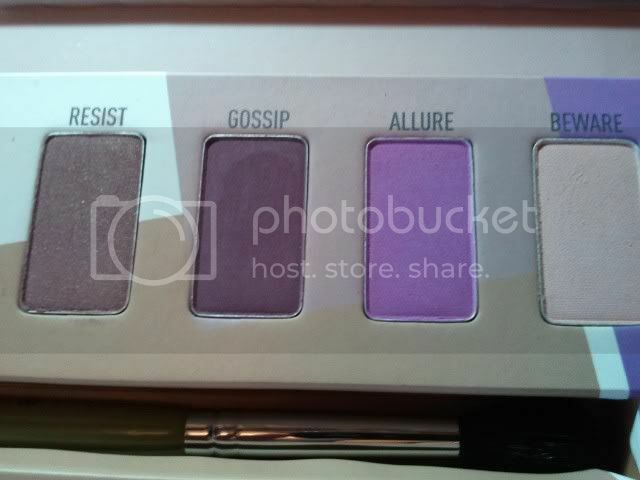 I already owned this color, and I have about ten of these in all. 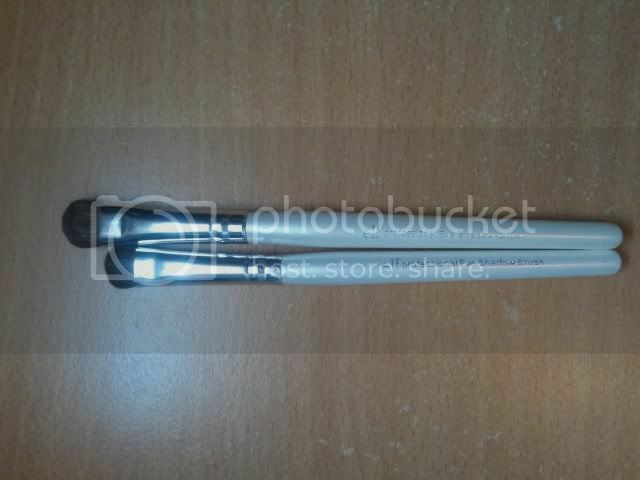 They have a skinny brush applicator that allows you to draw nail designs on your nails. 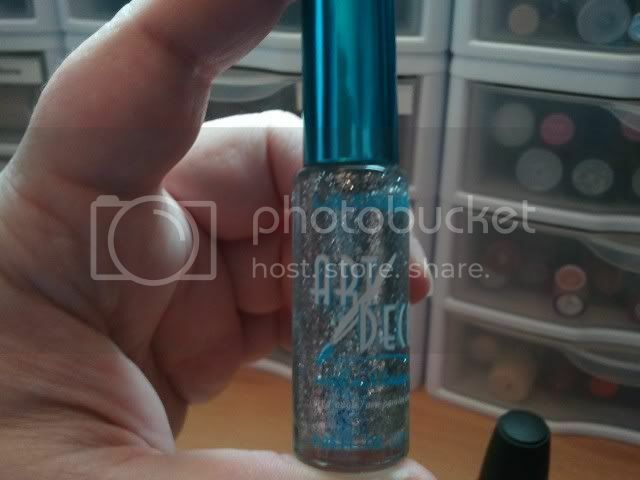 There are so many creative things you can do with your nails with this product. 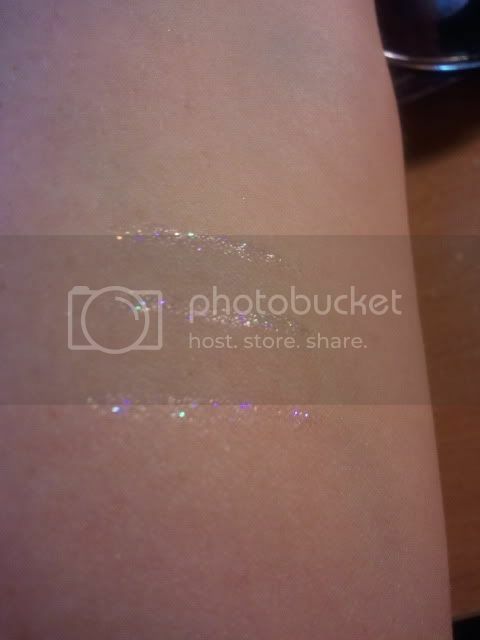 I don't have a photo to show you, but you get a lot of glitter with just one brush stroke. These are amazing and very inexpensive. I think they are readily available, at least in my area. I think they are a must have ... in every color! Overall, the quality of L.A. Colors is amazing. It exceeds your expectations from such an inexpensive product. Since I found the makeup brushes I raved about in my video (when I decided to give some away) I have purchased many more of the products in the line. I have not been disappointed once. These products are definitely worth trying! Hi everyone! Due to the holiday weekend, I haven't had time to write a new blog yet that refers to this new contest. But I did want to have a place for you to comment telling me that you are following me here for the 20 extra entries and what your YouTube name is. I want to make sure that you get the credit for doing so. When I finally post the blog that will include prize pictures (hopefully tomorrow) I may take this one down. But rest assured I will have your entry counted. I have a notebook dedicated just to this contest, just so I can stay organized. I have contacted some people to tell them they don't have valid entries and what they need to do to change them. As the responses keep coming in, I know won't be able to do that for the duration of the contest. So please check and double check your entries with the contest video, the annotations, the description box, and any updates you see to make sure your entries are valid. There should not be any more updates. There have been changes I did not have anything to do with. The changes pertaining to my own rules were made in attempt to increase your chances of winning. I thank you for your time in subscribing to my channels, creating awesome entries for me to watch, and for every comment. So look below here and click inside the white box to add a comment if you are entering your YouTube name and I would love you to summarize all of your entries for me! Thanks! L.A. 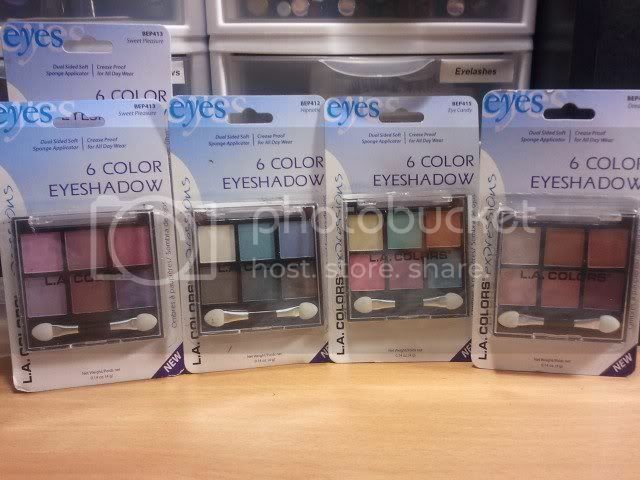 Colors Eye Brush Sets & Eyeshadow Palettes Giveaway! L.A. 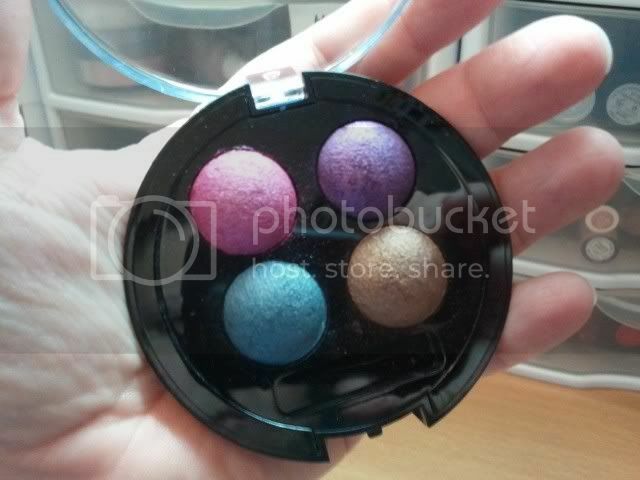 Colors Eyeshadow Shader & Blender Brush Review & A MAKEUP GIVEAWAY!! Above is the link to my YouTube Giveaway Channel where you can watch the giveaway announcement video! 1. You must subscribe to my channel. 2. You must like & favorite this video. 3. You must have your favorites box open so I can see that you followed the rules. 5. One comment PER PERSON. If you comment more than once you will be disqualified. 6. If you are under the age of 18, please have your parents permission to enter this contest so that I have their permission to send the products to you if you are a winner. no "Enter Me" comments please. ****Video Responses**** I decided to allow video responses! If you make a shout out video about my channel and THIS giveaway, you can get 10 extra entries! If you want to create a Bright LA Colors inspired, COLORFUL look in a video response, I will give you 20 extra entries. So you can get a total of 31 entries if you do all 3. The shout out video can be a slideshow, but the look you create must be live. You don't have to do a tutorial, just show the look that you did and some of the products you used. If you want to COMBINE the shout out to my channel along with your look, that is cool too! If you have any questions, please message me. This is my first giveaway so I am hoping I didn't leave anything out! Please also let me know if anything is unclear, I will appreciate your feedback. This contest is only open to U.S. & Canada residents, but I will have giveaways in the future that will be international I PROMISE!!! 5 Winners will receive 1 set of L.A. 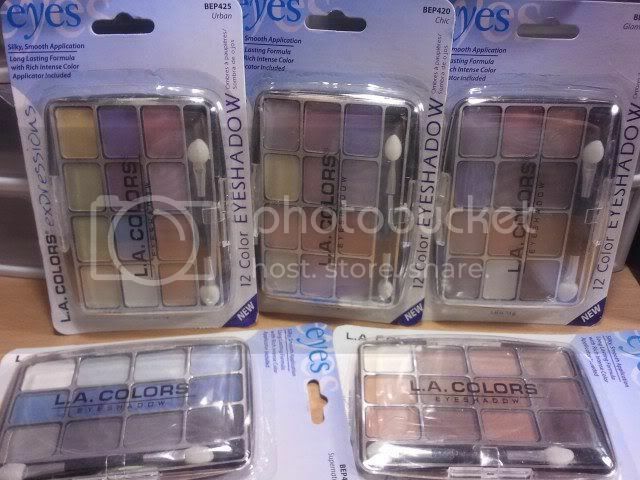 Colors Eye Brushes, One 5 Color Metallic Eyeshadow Palette, One 6 Color Eye Shadow Palette, One 10 Color Eyeshadow Palette, & One 12 Color Eyeshadow Palette. So that is a total of 5 WINNERS that will get 5 PRIZES!! All L.A. 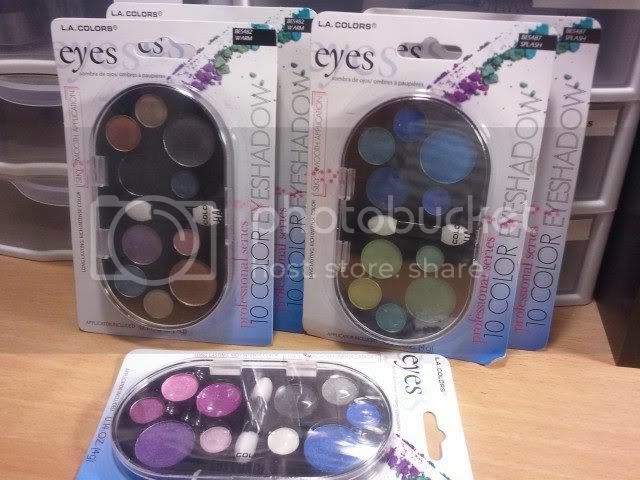 Colors Items!! Giveaway runs through 6/28/2011-7/19/2011. Winner will be announced on 7/20/2011. I will be using a random generator to choose the winner and will upload a video showing the results and the winners! This giveaway was extended one week & ends on the 27th! There is a link on my page to Volleyballgirlxoxo so that you can find her page. It is VERY important that the winners contact me ASAP because the other winners will have their prize packages held up until the winners before them choose their prize selections. I will choose a reasonable time limit in which you will have to contact me or I will have to choose another winner. I will announce that time limit in winners video. Good luck to everyone that enters this contest. Let me know if you like receiving L.A. Colors prize packages and/or what other kind of prizes you would be interested in winning and I will do my best to accomodate you! I bought this product at CVS back when they had a BOGO half off, and I also had a manufacturer coupon. I don't remember what I paid for it (and prices will vary depending on where you buy it)﻿ but you can pick it up for anywhere between $10-$15. This has become my favorite face primer. I would quickly call this a holy grail product. Have you ever used a product and it totally exceeded your expectations of it? For me, this happens rarely. (I can only think of a few off the top of my head that I have felt that way about ... in my entire life.) This was definitely one of them. I like it that much. What the product claims: "Get the perfect skin texture, instantly and all day. 1. Smoothes lines, 2. Hides Pores, and 3. Banishes Skin Imperfections. The silky lightweight formula glides onto skin, leaving it velvety-smooth to the touch. The result- a unified matte finish that's flawless. It says it is suitable for all skin types, dermatologist tested, and non-comedogenic." ...and it really delivers. 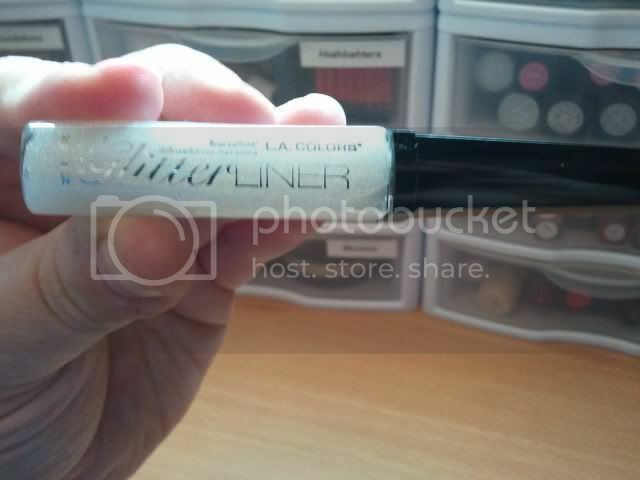 The best thing this primer does for me, is INSTANTLY diminish the appearance of my pores. 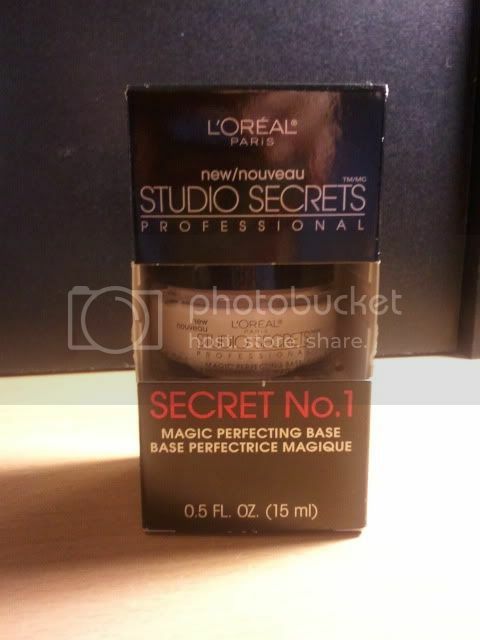 I think I have large pores and I HATE the way foundations and concealers settle into them. That is a horrible look. When that happens, the only thing I can do to fix it, is wash my face. This primer is so silky on your face. It does also fill in some fine lines I have around my eyes and forehead. I honestly can't say that I have noticed a change in how long it makes my makeup last, but I definitely know that it makes it look better. 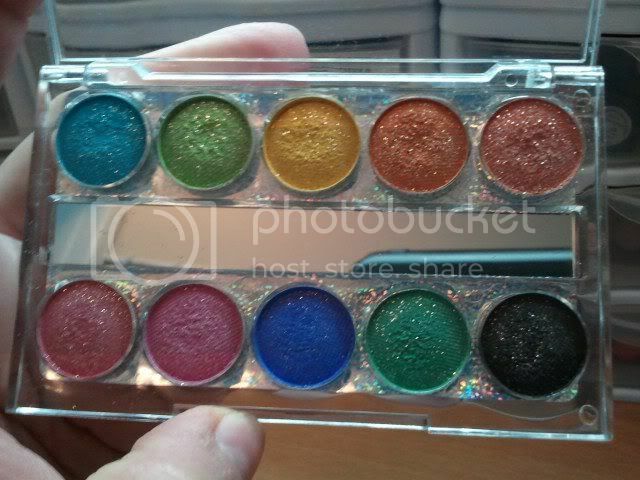 I would even wear this WITHOUT any other makeup and it would make a difference in the way my skin looks. I highly recommend this product. If you have large pores, I suggest you run to the nearest place you can buy this product because you won't be sorry. I have already purchased two backups myself. I absolutely love it and can't say enough about how it performs. Referral Link to My Favorite Makeup Brushes!! Click on this image to be sent to my YouTube channel! Hi everyone!!! 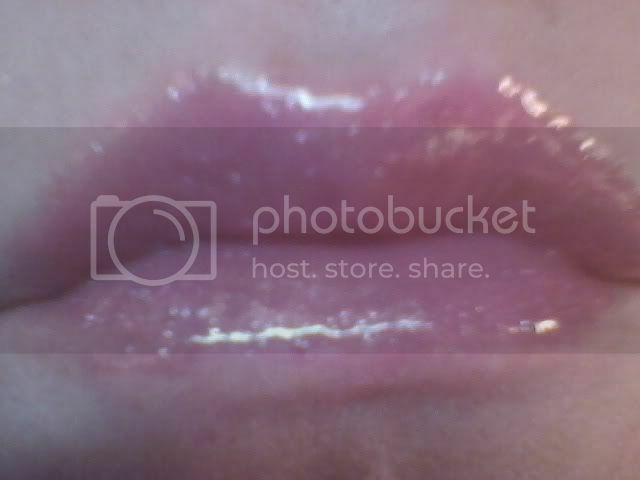 Thanks for taking the time to check out my beauty blog! 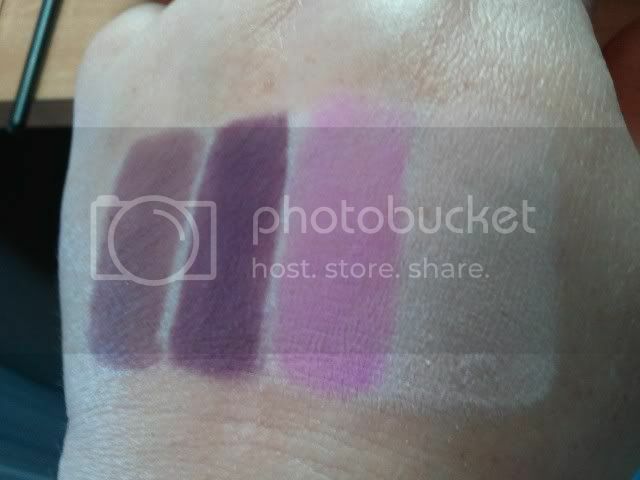 Here I will mostly be doing product reviews, or just talking about makeup/beauty products in general. 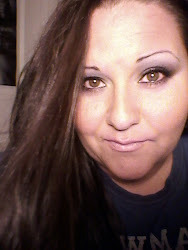 Please check out my facebook fan page and my YouTube channel! I would love for you to suggest a product for me to review, just go to my YouTube channel and send me a message there. That is the best way for me to find it. You can also leave a comment on my Facebook page. If you would like to subscribe to this blog & have e-mails sent to your inbox, you can sign up below. I would love it if you would support my YouTube channel by clicking the "Join This Site" button above and by "Liking" my facebook fan page below! I am glad that you stopped by, if you leave a comment on one of my posts I will know that you were here! Hope you visit again soon! 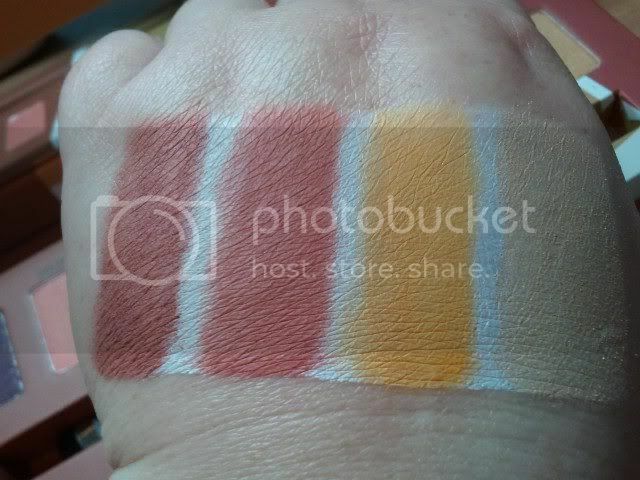 Wet n Wild Fastdry Nail Polish Bucket Set!